Description: For tractor models from 1939 to 1952, carburetor part #: Marvel-Schebler TSX241A, TSX241B, and TSX241C, Ford 8N9510C. 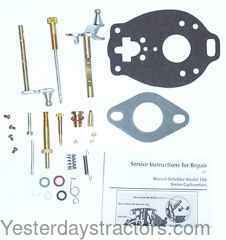 Kit contains parts necessary for major carburetor overhaul, including a Viton float valve. For 8N, 9N, 2N. Does Not include Float.